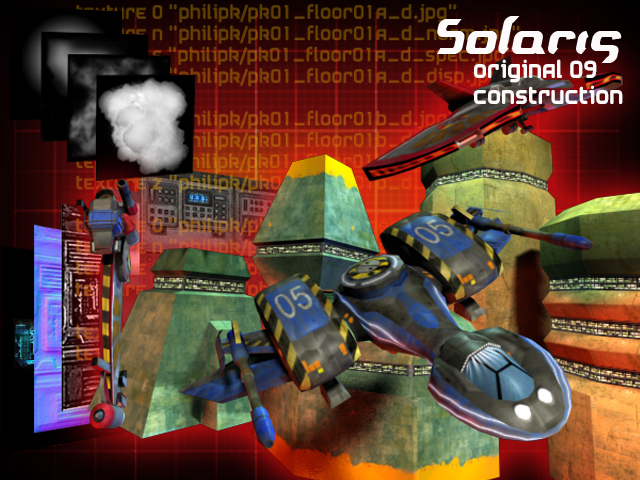 Solaris Construction set is just only some 3D objects in obj mode that you can use to ambient some maps, there are some distant constructions, some ships. Also have some diferent fog textures, a a log series of classic material with NORMAL,DISPLACEMENT and SPECULAR texture. When it was released on 2009, most of textures where planar. Interesting. Could of been apart of cube. It would be awesome if cube has Drivable Vehicles. Anyways, I don't think stuff like that will ever be officially implemented in Sauerbraten, as it's a showoff of the engine and not a game that's gonna get more and more features..
For SP maybe, but how the heck do you wanna do it in multiplayer? Indeed as you'll have trouble with the boundingbox also. Boundingboxes wouldn't be that much of a problem. The only big problem is bringing this to the ppl. The second big problem would be: who handles the vehicle entities? How are they added? Are they more like bots? Or more like items? Does the server have to handle them, kinda ruining the idea behind sauer's server/client system? Or do you hand it over to the client, possibly giving chances for entirely new cheats, such as wreaking havoc in insta with a tank? They can be added as a barrel-entity in SP.